SXSW was great and my sets went really well. Shot some cool video footage while there, coming soon. 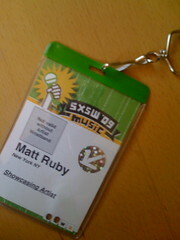 Meanwhile, you can check out my SXSW updates at Twitter. Some links to pics there too. Start from the bottom and read up if ya want it in chronological order. Stay tuned for the video, you'll dig it. good times man. glad you enjoyed yourself! see ya soon. Don't know if this is your first big festival but congrats...seems like a big step!